It all started back in 2002, whit Groove Armada and Jools sitting in a pub, lamenting the lack of exciting line-ups at London party scene. Just a few years later, in 2005, Lovebox was already a full-blown festival, taking place across two days in east London’s Victoria Park. 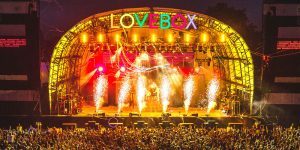 After 13 years in Victoria Park, Lovebox announced that it was moving to a new home, along with its sister festival Citadel. The reason was that Victoria Park is reserved for the new festival All Points East for the next five years. Now, the legendary festival is relocating to Gunnersbury Park in west London, in a move that has been described as “fantastic news for Londoners” by Amy Lame. Last September, Gunnersbury Park hosted the London Mela, a festival celebrating South Asian culture. More than 80,000 people attended this free admission event. West Londoners certainly proved they can party! This year’s Lovebox will be held on 13 and 14 July 2018, followed immediately by Citadel on 15 July. Skepta, SZA, Mabel, Anderson.Paak & The Free Nationals, Kerri Chandler & Jeremy Underground, Jacob Banks, DAVE, Wu-Tang Clan, Diplo, Vince Staples, Jackmaster, Bicep, Floorplan, Peggy Gou, Cashmere Cat, Mike Skinner & Murkage, MHD, D Double E, DJ Q, Ms Banks, Steel Bangles, Just Jam Takeover, Sian Anderson, Star.One, Saoirse, Cici, Jane Fitz, Moxie, The Blaze and Motor City Drum Ensemble. Childish Gambino, The Internet, Annie Mac, Kali Uchis, Loco Dice, Shy FX, Belly, B.Traits, Blackbear, Tensnake, Casisdead, Krystal Klear, DJ Zink B2B Special Request, Preditah, Jamz Supernova FT Stush, Black Party, Happy Meals, Andrew Hill, Mella Dee, Big Boi, Green Velvet, Pharrell Williams with N*E*R*D, Action Bronson, Jon Hopkins, Camelphat, Denis Sulta, Mura Masa, Solardo, and Mall Grab. Stages include Mike Skinner & Murkage Present Tonga (Friday), The Sweet Spot, Noisey, Jackmaster Presents Mastermix, Corona SunSets Stage, and Kopparberg Outsider. In addition, Lovebox features Hip Hop Karaoke with hundreds of songs to choose from, and a chance to experience real crowd energy on stage. Also, Sharp’s Brewery will offer a selection of first-class beers from a variety of great bars! Citadel is also to be held in Gunnersbury Park, and its line-up includes Tame Impala, Chvrches, Leon Bridges, Fat White Family, Goat, The Horrors, La Femme, Honne, R+R = NOW, and Dermot Kennedy. Tickets for Lovebox are currently from £66.25 for one day or £115 for both days: get them while you still can. The first release of tickets for Citadel is already sold out, but you can still buy a second release ticket for £55.25. The festivals are promising chilled-out days of amazing music, great food and incredible fun!